Though it looked like the stunt had made its way through all the requisite stages—outrage, remorse, and GWAR—Kathy Griffin’s decapitation photo shoot hasn’t fully faded from the public consciousness. Well, most people on Twitter have moved on to the next furor, but this administration has a long memory. Not for boring stuff, like names of world leaders, but rather, for criticisms of the president. 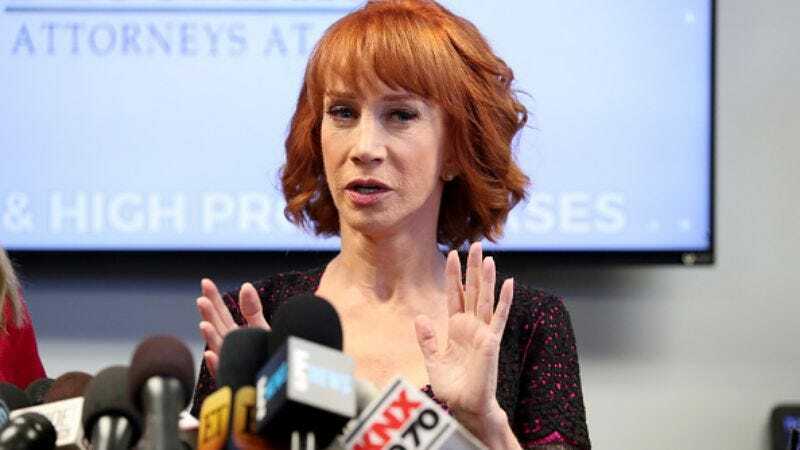 A little more than a month after Griffin posted the photo of what appeared to be the severed, bloodied head of Trump, the still sort-of working comedian was grilled by the Secret Service. According to political reporter Yashar Ali, Griffin was interviewed for over an hour by the federal law enforcement agency, as the investigation remains open. Although Griffin didn’t comment on the Secret Service interview, she did tweet at TMZ, which broke the story. Griffin’s post linked to a ThinkProgress story on TMZ’s side hustle as a pro-Trump media outlet, as well as founder Harvey Levin’s cozy relationship with the president and his surrogates, proving that maybe her spirit isn’t totally broken.